Home » Blog » Distilleries » Bardstown Bourbon Co: The Coolest Distillery You’ve Never Heard Of? I forgive you if you haven’t heard of Bardstown Bourbon Company (BBCo). I first caught wind of the large-scale Kentucky distillery from Delilah’s owner Mike Miller at last year’s Chicago Independent Spirits Expo. But it wasn’t until a few months ago that I learned of the massive undertaking, exceptional bourbon talent, and lofty goals of the project. Over drinks with Joe Stark, Senior Account Exec at Chicago marketing and PR firm Ro-Bro, he invited me to tour the new distillery before it opens to the public. Being invited for a private tour of one of the country’s largest bourbon distilleries doesn’t happen everyday. I polished my favorite tasting glass and packed in the car with my wife and son for a weekend in Kentucky! We arrived at the distillery on a beautiful Friday afternoon to meet our tour guides, Steve Nally and John Hargrove. Those are a couple of bourbon names you may recognize. Steve Nally is the former Master Distiller for Maker’s Mark, and a member of the Kentucky Bourbon Hall of Fame. John Hargrove spent two and a half years at Sazerac, the last year and a half as Master Distiller at Sazerac’s Barton 1792 Distillery. Before Sazerac John spent 8 years honing his operational skills at another large beverage company, PepsiCo. Steve is now the Master Distiller of Bardstown Bourbon Company and John fills the role of Executive Director of Operations. 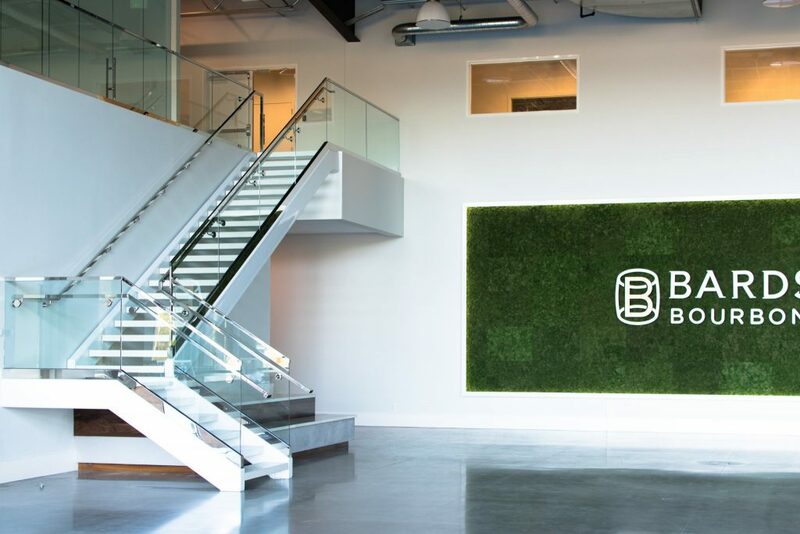 We started our tour in the main lobby; an open area with a two-story ceiling and large grass wall emblazoned with the BBCo logo. The building is the work of local Louisville architecture firm Joseph & Joseph who have worked with over a dozen of the biggest names in Kentucky bourbon. A floor to ceiling fireplace stands across from a kitchen area flanked by a tasting bar and gift shop. The tasting bar and gift shop were filled with Copper & Kings “Collabor&tion” bottles, the first of many collaboration projects on their roadmap. Steve and John led us to the second level where we walked over a floor made entirely of metal grates, past a window overlooking the grain silos, and through a collection of 8 gigantic two-story fermentation tanks. Eight more tanks of equal size were recently added in a second connected area to bring their total fermentation capacity to 200,000 gallons. Walking past one of the many touch-screen panels that assist in operating the distillery we entered the still area. Steve and John explained that their custom computer system guides the distillery operators but people are ultimately responsible for making decisions and crafting their whiskey. The major advantage of their computerization is detailed logging of every data point during the distillation process. From this they will be able to do trend analysis and continue to innovate their process to produce the highest quality whiskey possible. As we walked into the still room the temperature immediately shot up by about 20 degrees. The 45 foot tall 36 inch diameter custom Vendome still is a sight to behold. Twenty two “sight glasses” act as large windows into the column while it actively runs. A custom design that is the first of its kind. Each window has a lever to the side that sprays water on the glass to clean away wet grain and offer a clear picture of the action inside. The column spans 4 stories of metal platforms with 15 stainless steel stripping trays and 5 copper rectification trays. The still takes in 45 gallons per minute of beer wash and puts out an impressive 7 gallons per minute of 130-140 proof distillate. The team is now filling 150 to 175 barrels a day with the ability to fill up to 250 per day. The big question is, what are they doing with this incredible production capacity? Bardstown Bourbon Co is positioned as a contract distiller. As of my visit they are working with 17 different brands to produce fully customized products to the exact specifications of the customer. They call this their Collaborative Distilling Program. The customers they work with are able to discretely produce or to advertise their partnership with BBCo. They work primarily with established brands in need of additional production capacity. Western Spirits, makers of Lexington Bourbon, Calumet Bourbon, and Bird Dog Bourbon are a publicised partner. The collaboration with Copper & Kings this year is their first public product launch. Constellation Brands, owners of High West Whiskey acquired a minority stake in BBCo late last year. We can assume new American Whiskey products from Constellation will come from this distillery. Other customers have chosen to keep their agreements with BBCo under wraps for the time being. Though the goal of BBCo is to provide a world-class production facility run by the most capable team in the industry that their collaboration partners will be proud to advertise. At this time they aren’t working with startup brands. They have a strict vetting process for potential customers and, John tells me, have turned away twice as many as they’ve accepted. As we left the heat of the still room Steve told me they distill 25 different mashbills for their customers, 5 to 6 different recipes each week. That number blew me away. Some distilleries may primarily produce just a single mashbill (Maker’s Mark) or two (Four Roses) or up to 5 (Buffalo Trace). But 25 mashbills running through a single still?! How can they possibly manage that chaos?! The computer system we mentioned earlier helps them keep track of and schedule each mashbill. Similar mashbills run in succession to somewhat simplify the process. A sour mash process is primarily used though a sweet mash is necessary after a shutdown or major recipe change. John tells me they have daily meetings to review their successes and challenges; to tweak their efficiency. As we walked through the distillery and I asked the guys about each process a recurring response went something like this. “We draw on our experience to guide our customers but in the end they have complete freedom over every aspect of the process.” From grain source to yeast strain to fermentation temperature and distillation proof. Even barrel source- they source from 5 cooperages, to char level and even rickhouse location. MGP has enjoyed tremendous success enabling brands to bottle bourbon and rye under their own labels. The whiskey they make is good, very good. At this point if I see a “new” brand that I know is 10-year-old MGP I’m pretty confident it’s going to be good to great bourbon. But MGP made their bourbon to their own specs, their own mashbills, yeast, barrels, and barreling proof. Brands buying these aged barrels and often coming in at the end of the maturation process, tasting many barrels and choosing the ones they like. BBCo has a key differentiator. BBCo is involving the brands they distill for from the very beginning. Working with them to craft the exact whiskey they want. Brands choose their own mashbills, their own yeast, barrel char etc. So is this still “sourcing” whiskey? It’s much more than that. Sourced brands of the future, 2,4,10 years from now, will be bottling juice they had a hand in creating from day one. Steve and John tell me their customers can even distill with them if they choose. According to the team at BBCo this “ensures consistent, high quality production that can rapidly scale. Brands control the future of their product.”. This is huge. Today, if a brand sources 100 barrels there’s no guarantee that the next hundred they get will match the flavor profile their fans have come to love. In fact, last year Smooth Ambler ran into this very issue and decided to discontinue their popular Old Scout 99 Proof and Old Scout Ten. Bardstown Bourbon Company is growing…fast. Bardstown Bourbon Company isn’t slowing down. They started in 2016 with an annual production capacity of 1.5 million gallons of whiskey. They built with the ability to expand and expected to complete a first expansion around year 4 of operation. Due to incredible demand they instead doubled production to 3 million gallons within the first year. With 2 uniquely architecturally focused rickhouses now, each able to hold 22,500 resting barrels, and 10 new rickhouses in planning with the intent of building 2 to 4 per year on their 100 acres of land. They have over 22,000 filled barrels today, the oldest clocking in at 1 year as of September 2017. When we toured the still, John and Steve pointed out the cutout in the metal grates just next to the still and the roof above with its large red metal trapdoor. A second 45 foot Vendome still will be lowered in this June to once again double their capacity to 6 million gallons. Existing contracts account for every ounce they produce well into 2019. A large glass room overlooking the distillery on one side and the visitors center on the other is configured for bourbon education. John tells me they are in talks with Louisville’s Stave & Thief Society to offer the BBCo’s unique distillery to future Stave & Thief classes. A peek inside the lab. Our next stop was the lab to taste what the team has been hard at work distilling. In the lab they test incoming grain quality, store yeast strains, test and store distillate samples and keep nosing and tasting notes for every batch. If the tour is a treat for the eyes, the lab is a treat for the senses of smell and taste. This is where we sampled the fruits of their labor. As Steve pulled out sample bottles he told me that one of his first challenges at BBCo was becoming familiar with rye mashbills. With decades of wheated mashbill experience at Maker’s Mark, working with rye took some getting used to. Steve poured us the white dog, unaged, rye they are using for one of the products they’ll market under the BBCo brand. This mashbill is 95% rye, 5% malted barley. The whiskey has a nose of green apple and a sweet apple palate to back it up. As soon as I said that John confirmed fruit notes are often detected in this distillate. Next we tasted the Bardstown Bourbon Company’s namesake bourbon whiskey. Starting with the unaged 120 proof bourbon distillate (60% corn, 36% rye, 4% malt) we then tried that same whiskey after 10 months in an ISC #3 char barrel. Now 10 months is a young bourbon, especially aged in full size 53 gallon barrels. This is something I find important to keep in mind when tasting younger bourbons. I won’t make an apple to apples comparison between a young bourbon and a mature 4, 6, or 10-year-old whiskey. It just doesn’t make sense or do anyone any favors to do that. What does make sense is to judge the whiskey by it’s quality and potential. The 10 month old BBCo bourbon I tasted is good, it’s very good. At 120 proof the alcohol tends to dominate the nose at this point but some crisp green apple sneaks through. Adding water brings out clear notes of vanilla and thick oak on the side of the tongue with a viscous finish that lingers of fresh fruit on the back of the tongue. Because it’s good at 10 months I’m confident that the team they have in place will make sure it gets better each year until they believe it ready to be bottled. After all, of the 30 total employees at BBCo the average industry experience is an impressive 15 years. Steve Nally has done it all over the last 45 years in the bourbon industry. He spent 33 years distilling at Maker’s Mark, earning himself a place in the Kentucky Bourbon Hall of Fame in 2007. After a brief retirement Steve moved to Kirby, Wyoming around 2008 where he built the Wyoming Whiskey distillery and brand from the ground up. This puts Steve in a unique position, drawing from experience distilling one of the largest bourbon brands in the world, Maker’s Mark, to building a distillery, mashbill, and process from scratch in Wyoming. Steve brings to the table the experience needed to build a brand new distillery and quickly grow it to a massive scale. Throughout his career Steve has never left the bourbon industry. He told me he even drove a grain truck at one point when duty called! Rickhouses like nowhere else and a bright future in store. To finish our tour John took us through one of their rickhouses. BBCo has two 22,500 barrel capacity rickhouses currently storing over 22,000 barrels. These two rickhouses are their showpiece. Unlike any aging warehouse I’ve seen before these are architecturally inspired. Aluminum clad buildings with beautiful wood accents and floor to ceiling glass windows on the top 3 levels to show off barrels to the outside world. It will be interesting to see how the window facing barrels mature given years in direct sunlight. I’ve heard of “sun kissed” barrels from other distilleries being especially good! Before we left Bardstown Bourbon Company we looked out on a large grassy field. John told me they have power and water run to the field and are ready to host large gatherings in the future. The location of a future bourbon festival drawing thousands from around the world? Given their plans for a gourmet restaurant, and rumors of a hotel on the property, it wouldn’t surprise me one bit. With names like David Mandell, President & CEO, Garnett Black, VP of Operations, and Daniel Linde, CFO & COO, and an all-star board of directors they have the ability to bring their grand plans to fruition. Keep your eyes here for the latest Bardstown Bourbon Company announcements.